Last Thursday I had to travel interstate to attend my Grandfather's funeral. 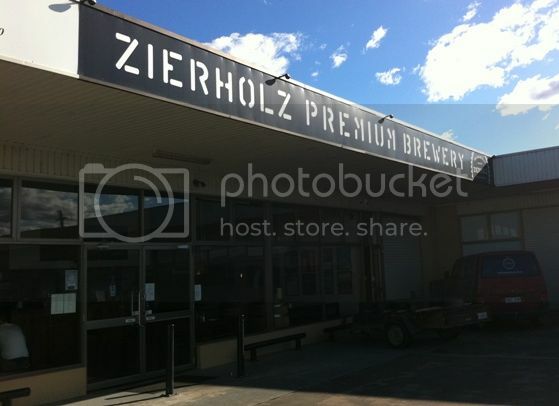 Naturally it was a sad day for our whole family, however in a break between the funeral itself and a family dinner my father and I along with some select family members managed to pop off to the only true brewery in the ACT, Zierholz Premium Brewery. Zierholz is the brain child of Christoph Zierholz, a German immigrant and dual Grand Champion brewer at the Australian amatuer brewing championships. He opened the Fyshwick brewery in 2008 and such was it's success that an on-site bar at the University of Canberra! I wish Monash had an on campus microbrewery/bar. Dad lived in Canberra for quite a while in his youth so knew his way around. 15 minutes after leaving the funeral we arrived at the brewery. The day we were there was so wet we didn't manage to get a good photo of the exterior so we grabbed this one off google (all rights attributed to the respective owners etc.). The brewery is set back from the road in this industrial area, very much like a number of microbreweries near where I work. We didn't let the rain deter us however and made our way to the bar where we were informed that a tasting platter was $12.50 for the 7 main beers and you got a pot of your choice at the end. That's a pretty good price, especially for a range of beers as vast as available on tap at Zierholz. The tasting platter at Zierholz is poured into small glasses, quite similar to a Kölsch glass. The beers are mostly German styles of beer and the the tasting platter comes complete with tasting notes, a welcome addition to help less experienced drinkers know what they are tasting. 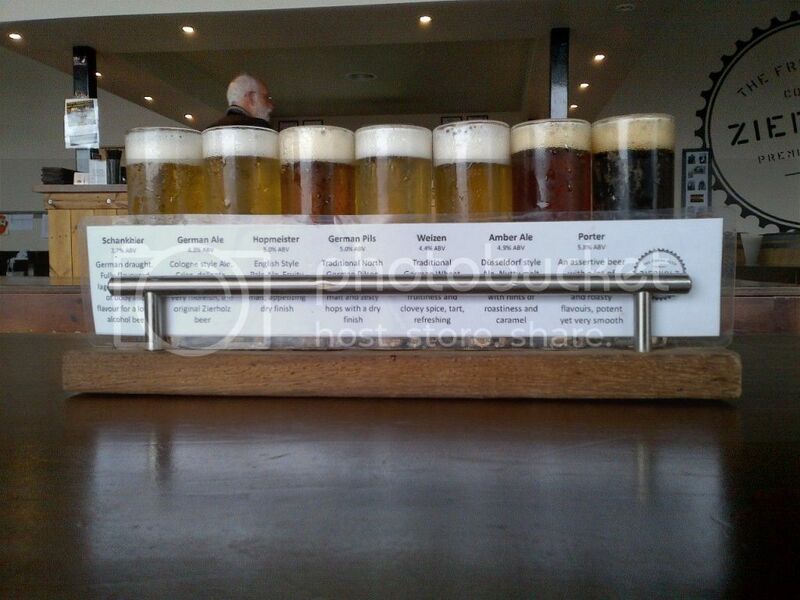 From left to right in the picture there was: Schankbier, German Ale (Kölsch), Hopmeister (English Pale Ale), German Pilsner, Weizen, Amber Ale and a Porter. I was quite impressed with all of them. Personally my favourite was the Hopmeister, an English Pale Ale with lots of citrus almost reminiscent of an American Pale Ale. Amongst the group we had there the Porter and Weizen were also very well received, the Weizen particularly popular with the girls. I also thought the Schankbier has a place in Australian drinking culture, a full flavoured lager with an ABV of only 2.7%. It was a really unique beer and Zierholz should be commended for brewing such a beer. Whilst at the brewery I thought it would be wrong to leave without sampling there current seasonal beer, the Sommerbier. This was a Belgian Pale Ale, which was absolutely perfect for the style and for the day. It was a seriously good beer and went beautifully with the bowl of chips we ordered. I'd love to go back there for a meal sometime, as their chips were outstanding! So to sum up our trip to Zierholz; the beers are fantastic, the food is fantastic and the bar itself is really cool. Despite the overall sadness of the day, this microbrewery visit was one of my all-time favourites! My one wish is that Zierholz would bring their beer outside of Canberra as it is good enough to be one of the top microbrewery's in the country. If you live in Canberra or a making a visit there a trip to Zierholz should be up there on your list of things to do.